You are here: Home / Common Concerns / What’s in a nappy? As new parents, we suddenly find ourselves examining our babies’ poo more closely than we could ever have imagined. We pay attention to the colour, quantity, texture and smell, and notice the slightest changes. We then go to the internet looking for answers and fear the worst. There are many versions of normal, and we will share some of these below. When your baby is born, your colostrum (first milk) has laxative and diuretic compounds in it to make your baby wee and poo. In the first few days your midwife and health visitor will ask how many wet and dirty nappies your baby has had, so you may find it helpful to take note of how many nappies you change. It can be tricky to tell if disposable nappies are wet – after five full days, when copious milk comes in, they should be heavy. 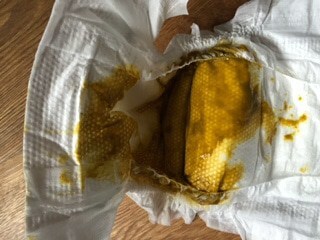 Many disposable nappies have a faint line down the middle of the nappy which changes colour when wet. You can feel what a properly wet nappy should feel like by putting three tablespoons (45ml) of water onto a clean, dry one. Urine should be pale and mild smelling. This post on signs of effective feeding has more information. 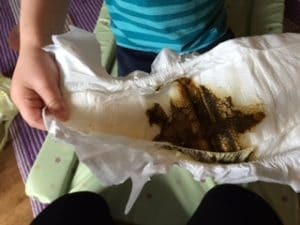 Pictures 1-9 below show the contents of one baby’s nappy in the first few days of his life, to give you an idea of what to expect from a healthy, full-term baby. If you have any concerns about your baby’s poo, or if you see blood in the nappy (beyond the first few days, when baby girls can have a mini period caused by birth hormones), don’t hesitate to contact your midwife, health visitor or GP. Baby’s first bowel movement, called meconium, is tar-like, sticky and hard to remove. 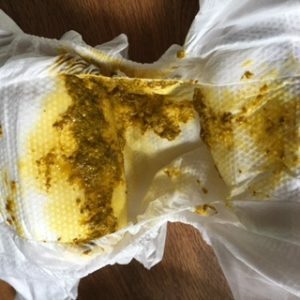 Poo from the first day of baby’s life. Reddish pink urate crystals are visible in this nappy; see picture 10 for more about urates. Bowel movement on day two. Your baby’s poo will gradually change colour, from black to green to brown. It becomes a lot easier to wipe off as your baby begins to drink more milk. Day three bowel movement. Looking a lot paler, heading towards a yellowish colour, and much less sticky. Day ten bowel movement. 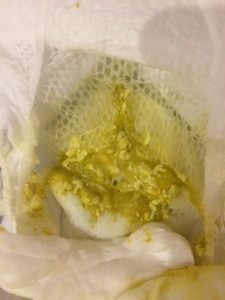 By this age most fully breastfed babies’ poo will be this pale yellow colour. 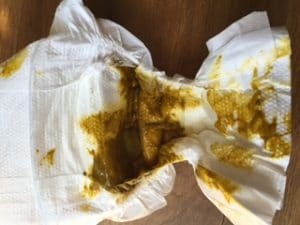 It is common for babies to have what are described as “explosive” poos, which may take you by surprise if your baby poos while you are changing her nappy! 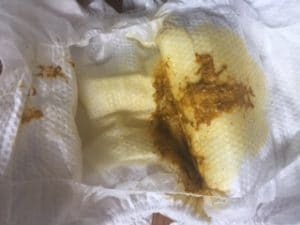 The following pictures show some ways in which your baby’s poo may look different from the typical pattern shown above. 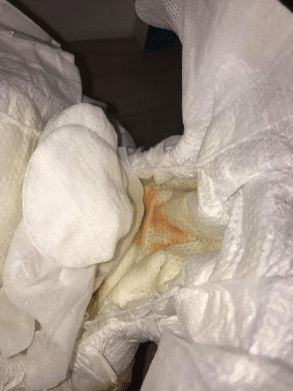 In the first few days, you may see reddish pink crystals called urates in your baby’s nappy. They are often described as looking like brick dust. As your baby begins to take more milk, the urates should stop appearing in her nappy. 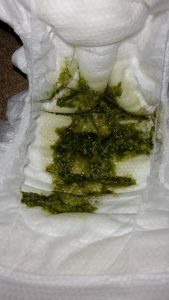 Sometimes your baby’s poo may be light green rather than yellow, and have small lumps in it like cottage cheese. This is common and not significant by itself, unless your baby has other symptoms that you are worried about. 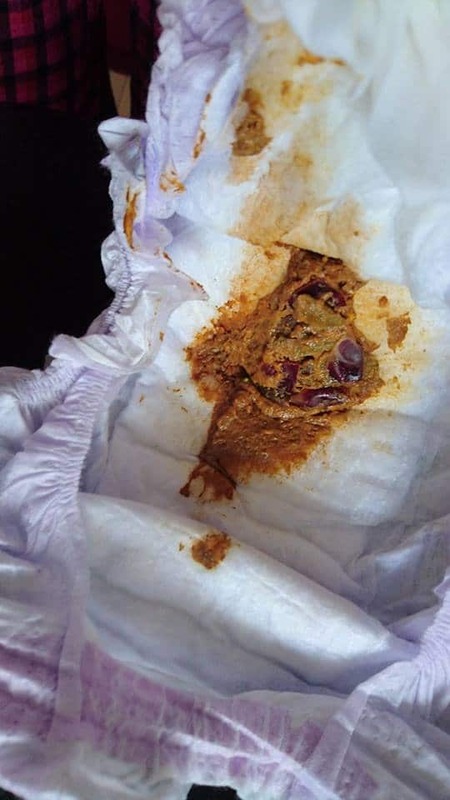 This poo came from a three-week-old baby who was given Gaviscon because of reflux. When the medication was stopped, the baby went back to having runny yellow stools. After the 12-week injections this baby had green poo, which went back to being yellow after a few days. 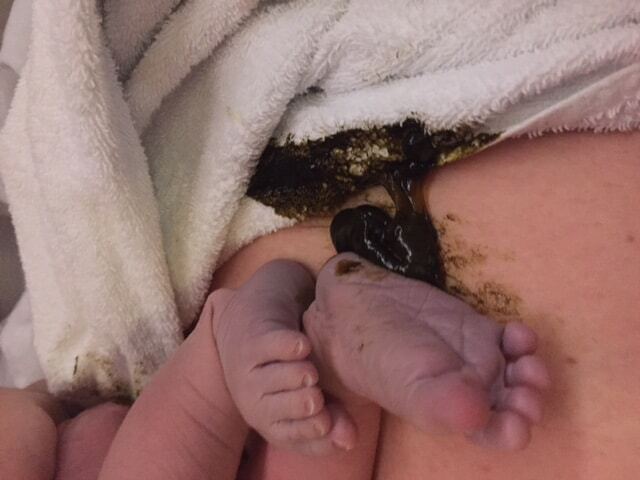 This dark green poo came from a baby who was later diagnosed with cow’s milk protein intolerance. 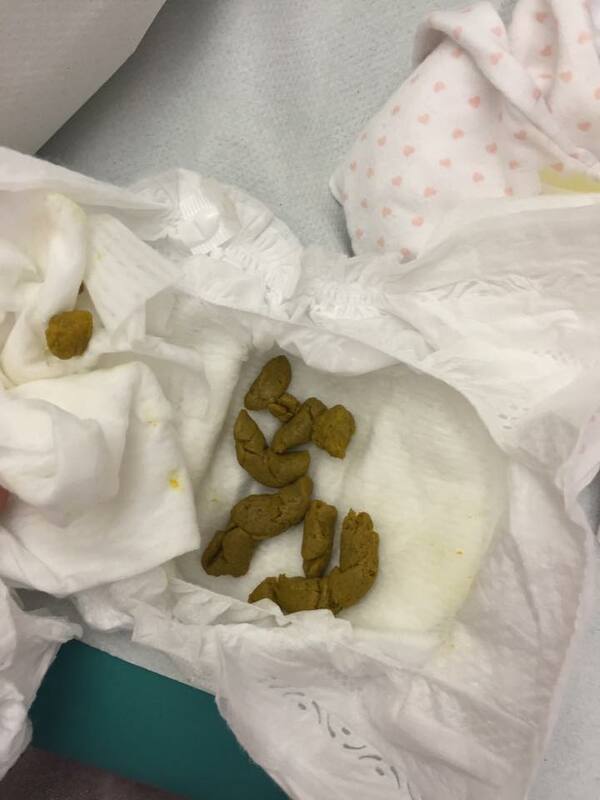 This poo, containing mucus, came from a baby diagnosed with allergies. 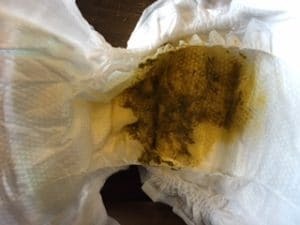 Mucus in the poo is also common when a baby has a heavy cold, but this should be temporary and should stop when the baby is well again. If your baby’s nappy has persistent or unexplained mucus in it, seek medical advice. As your baby starts to eat solid foods, you will see the results in his nappy. It is common for your baby’s very first foods to come out looking almost exactly as they did when they went in, as his digestive system is not used to dealing with these other foods yet. This is much easier to spot if your baby is eating finger foods rather than mashed food; the mashed foods are passing through semi-digested in the same way, but are less obvious in the nappy. 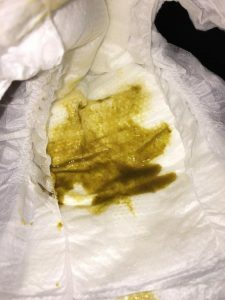 With time, your baby’s poo will gradually change from yellow liquid to soft brown lumps, and you won’t generally see pieces of food. However, some foods are hard to digest and tend to pass through the body unchanged (even for older children or adults). This picture shows an 11-month-old’s nappy with partially digested grapes visible in it. Strongly coloured foods (like blackberries or beetroot) can also affect the appearance of your baby’s wee and poo.